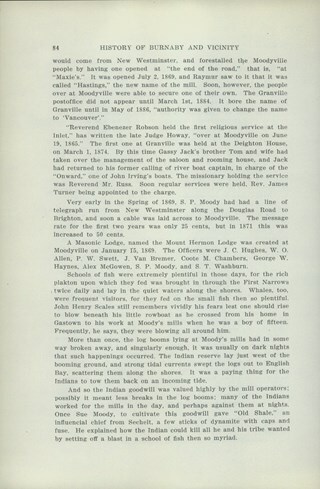 152 records – page 1 of 4. 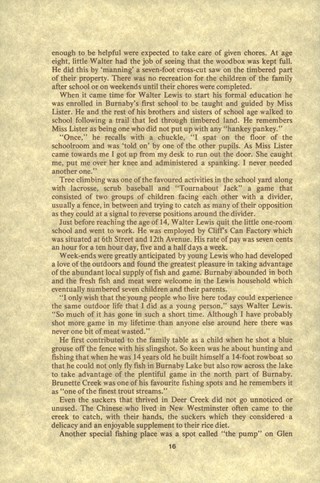 This portion of the interview pertains to Dr Blythe Alfred Eagles memories of growing up in New Westminster and visiting Burnaby with family. 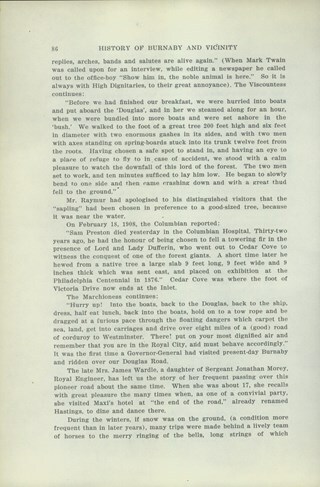 Dr Violet Evelyn (Dunbar) Eagles mentions when and where she was born. Recording is a taped interview with Dr Blythe Eagles and his wife Dr Violet Eagles by SFU (Simon Fraser University) graduate student Bettina Bradbury (and Ross S. McLeod) June 10, 1975. 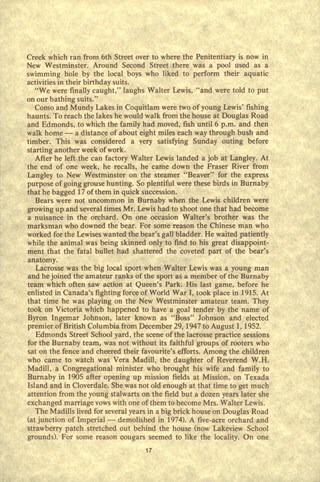 Major themes discussed are: the Depression, the War Years and Burnaby Lake District. To view "Narrow By" terms for each track expand this description and see "Notes". 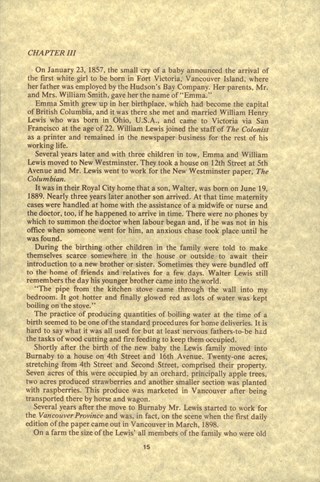 Blythe's paternal grandparents, Charles and Maude Eagles immigrated to New Westminster in 1887. Their son Jack married Amelia Jane Johnston, and Blythe Eagles was born in New Westminster in 1902. In 1918 Blythe enrolled at the University of British Columbia, and took a Physiology class with eight other top students - his future wife, Violet Dunbar was the lone woman in the class. 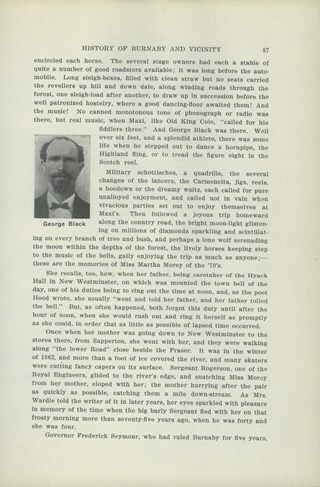 Blythe graduated in 1922, winning the Governor General's Gold Medal as top student. 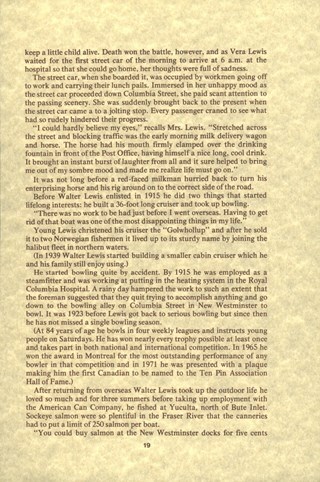 He received his MA in 1924 and his PhD in 1926 from the University of Toronto. He then completed his post-doctoral study at the National Institute for Medical Research in London, England. In 1933 Dr. Eagles became head of the Department of Dairying (1936-1955), Chairman of the Division of Animal Science (1955-1967), and Dean of the Faculty of Agriculture (in 1949 until his retirement in 1967). In 1968 he received an Honourary Doctor of Science Award from UBC Blythe was also one of the first appointments to the Burnaby Town Planning Commission. Violet Evelyn Dunbar was born September 29, 1899 in Ontario, the eldest child of John and Mary (Tompson) Dunbar. Violet attained her BA in 1921 and MA in 1922 from the University of British Columbia. 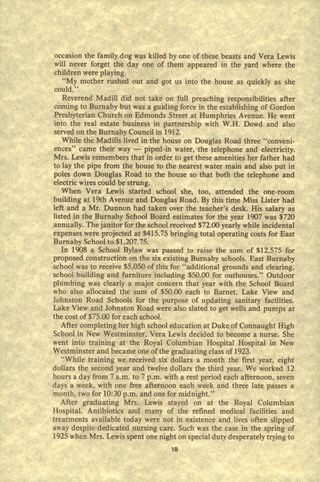 In 1922 she attended the Provincial Normal School and within six months had a teaching certificate and taught at Lord Hudson School in 1923. In September 1923 she was awarded a two-year scholarship to the University of Toronto, where she joined Blythe in the Bio-Chemistry Department. She received a second MA and a PhD in 1929. Her graduate studies entailed research in pure proteins and enzymes related to the commercial production of cheese. Through this work she was recognized as one of the leading enzyme chemists in the country, being a senior lab instructor of biochemistry. Violet was one of the founders of the Burnaby Council of Women and active member of the International Council of Women. 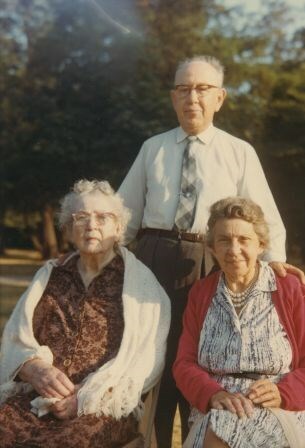 Blythe and Violet Eagles purchased property at Deer Lake in 1929 and began construction of their home shortly before their marriage on June 25, 1930. The Drs. Blythe and Violet Eagles Estate is a unique expression of the talents and tastes of both the Eagles and Frank Ebenezer Buck (1875-1970) who was head of the Horticultural Department and the Campus Landscape Architect at U.B.C. and established the plan for the Eagles garden while Blythe selected many of the plantings. The Eagles themselves designed the house as a romantic cottage inspired by the British Arts and Crafts style. Violet was an enthusiastic amateur gardener, maintaining and continually developing the garden. The Eagles were active volunteers in the local community as well as at UBC. When Simon Fraser University opened in Burnaby, they became well-known for entertaining dignitaries and special guests of the university in their lavish garden. 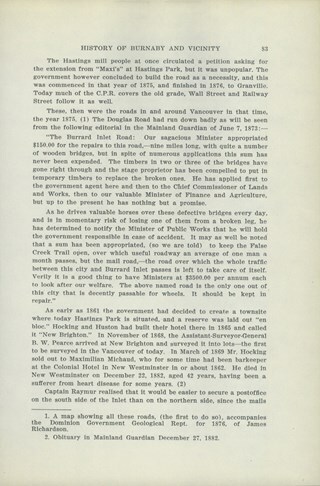 After Violet's death in 1993, the estate was sold to the City of Burnaby. The funds were used to establish a Chair in Agriculture at the University of British Columbia in their memory. 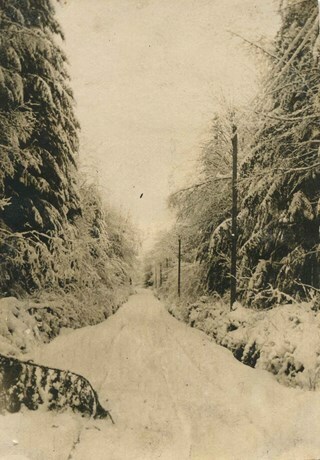 Photograph of Douglas Road covered with snow. 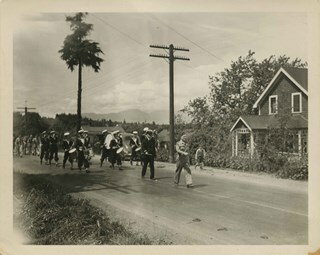 Photograph of the Valleyview Community Centre parade at Douglas Road. A marching band is walking down the street past a house. 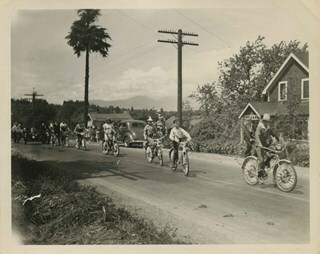 Photograph of the Valleyview Community Centre Parade at Douglas Road. Children and youth are in costume and on decorated bicycles. 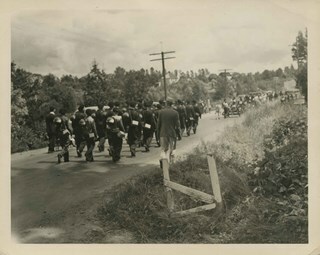 Photograph of the Valleyview Community Centre parade at Douglas Road. 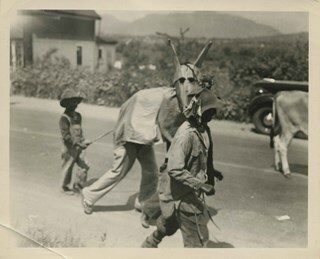 Children and youth are in costume, including two dressed as a horse or donkey. Photograph of the back Valleyview Community Centre parade at Douglas Road walking down the street, away from the camera. 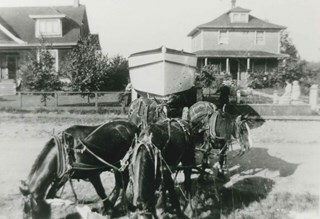 Photograph of a team of four horses pulling a boat in front of the Evelyn Lewis house on Douglas Road (the house - which is visible on the right - was built by Walter Lewis). 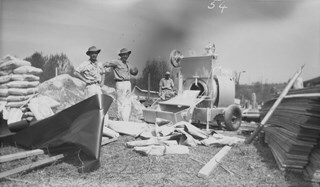 Photograph of Bert Porter with a municipal steamroller on Douglas Road. 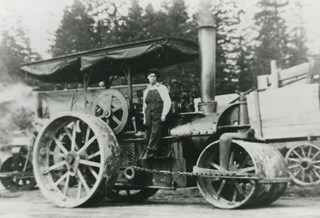 He worked many years operating a steam roller for the municipality, flattening out gravel streets after grading, and was the husband of Lillie Lewis Porter. Photograph of Douglas Road at Haszard Hill. 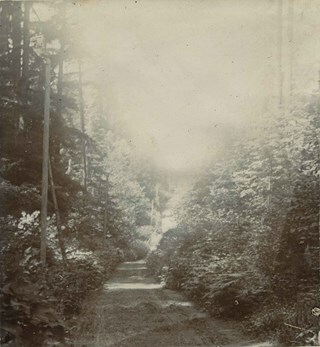 Type note under photograph reads, "Douglas Road, 1895. 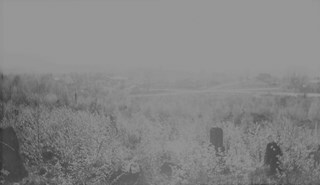 Deviation from old road, seen on right at, then, Haszard Hill, now Rayside Ave, looking eastward up the hill." 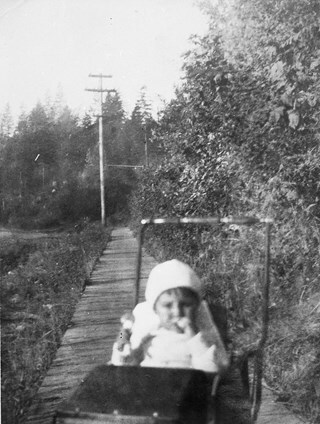 Photograph of a child in a baby carriage on a board sidewalk on Douglas Road. 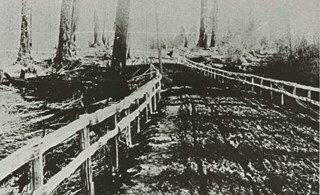 Photograph of a trail through the woods that is labelled "Douglas Road." Photograph of Edwin Wettenhall Bateman standing between a draft horse and a milking cow on his property. The horse is being held by his muzzle with Edwin's left hand and they are both facing the cow. The cow is being held by her halter with Edwin's right hand and her lead is hanging loosely to the ground at their feet. 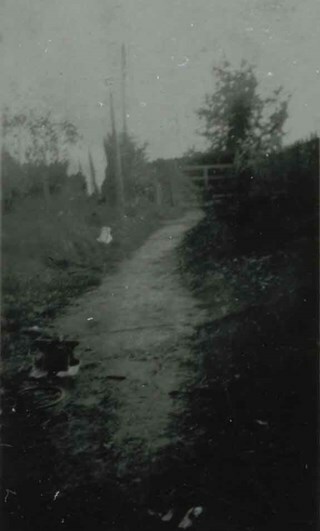 The photograph was taken on the Elworth property at the hobby farm just east of the main house. Note in pencil on verso of photograph reads: "Edwin Bateman with horse + cow On Hobby farm located just east of Elworth on Douglas Rd." and "# 3"
Photograph of Murdoch McMurray driving a team of horses reined to a cart on a gravel road. 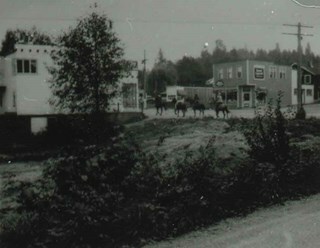 An accompanying note identifies the photograph as: "Mr. McMurray with his first team of horses (picture was taken in 1911) hauling crushed rock on Douglas Road when it was being macadamized from 10th Ave. to Boundary Road. This portion of the road was near Still Creek. (Fred McPherson was Municipal Engineer at this time.)" Copyright holder is unknown. Reproduce for fair dealing purposes only. Inscribed in pencil, recto, b. 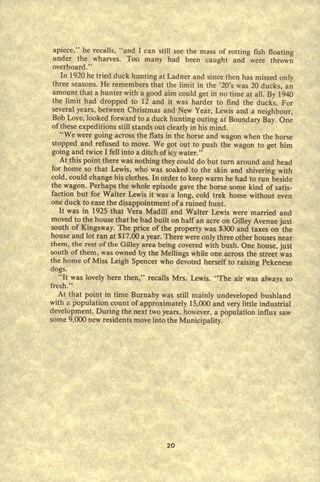 "Co op store Douglas R." and in blue ink, verso, t. "Coop Store Douglas Road/ C.G. Co-op 1939", b. "Mr Love Mayor of/ store/ no 2", in blue ball point pen, l.l. "Main Store was at McKay station/ this is No 1 Branch store" stamped on verso, c. "VANCOUVER/ DRUG CO. LTD/ SEP 12 1938/ Nu-Gloss"
Photograph of a man in an apron standing in front of a co-op store bearing the sign "C.G. Co-operative Association", otherwise known as the Army of the Common Good. Window displays include the goods he carries and advertising signs for Coca-Cola and Orange Crush are put up below the windows. In front of the store is wood plank sidewalk. Photograph of the McWilliams house on Douglas Road. Mamie Bateman McWilliams lived here with her family and is the daughter of Edwin Wettenhall Bateman, who built Elworth (directly across the street). Stamp on verso of photograph reads: "Better Pictures/ NuGloss/ PHOTO FINISH/ Vancouver Drug Co."
Photograph of the McWilliams house on Douglas Road. The house has a large patio area with a gravel road in front and a wood fence behind. A boy is sitting with a dog on the front steps. Mamie Bateman McWilliams lived here with her family, and is the daughter of Edwin Wettenhall Bateman, who built Elworth (directly across the street). Photograph of a group of farmers loading their crates onto a railway car. Identified (left to right), Bernard R. Hill, Louis Claude Hill, Charles Sprott, George E. Clayton, and Edgar Sprott, who are loading up their strawberries on a street car. The farmers are lined up in a row, each sitting in their own horse and cart as they bring their strawberries to the station. 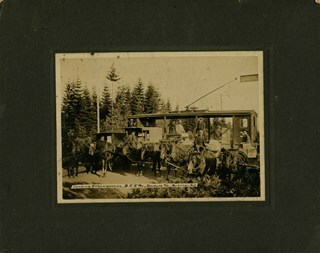 Caption on recto of photograph reads: "Loading Strawberries, B.C.E.Ry., Douglas Rd., Burnaby, B.C." 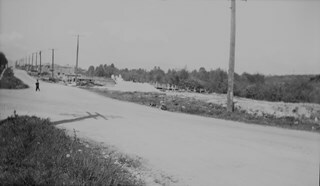 Photograph of Gilmore Avenue and Douglas Road with a car parked at the side of the road and two men with surveying equipment. This is part of the Willingdon Heights subdivision site. 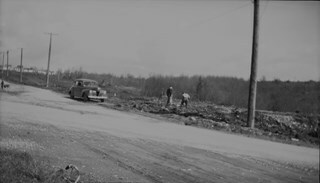 Photograph of Gilmore Avenue and Douglas Road including a London mixer and contractors invovled in house construction. The man standing in the center has been identified as Mr. Marcowitz. This is part of the Willingdon Heights subdivision site. Photograph of Gilmore Avenue and Douglas Road. This is part of the Willingdon Heights subdivision site. Photograph of cleared land at Gilmore Avenue and Douglas Road. This is part of the Willingdon Heights subdivision site. Photograph of cleared land at Gilmore Avenue and Douglas Road. Houses under construction can be seen in the background. This is part of the Willingdon Heights subdivision site. 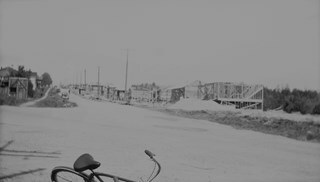 Photograph of the Gilmore Avenue and Douglas Road intersection with houses under construction on either side of the road, and a bicycle in foreground. This is part of the Willingdon Heights subdivision site. Photograph of C.F. Sprott's House at Douglas Road and Norland Avenue. A unidentified man is standing on the porch steps. 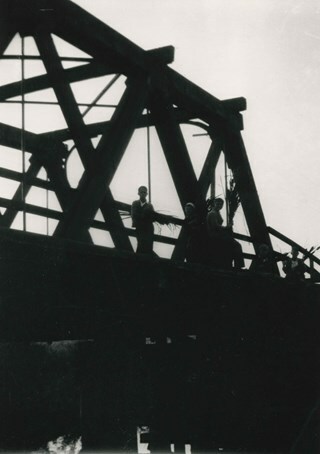 Annotation at bottom of photograph reads, "C.F. 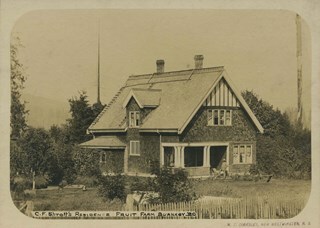 Sprott's Residence, Fruit Farm, Burnaby B.C." Annotation underneath photograph reads, "W.T. 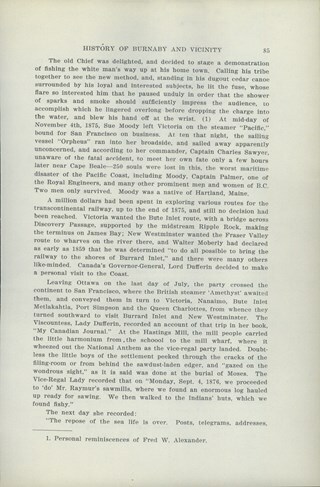 Cooksley, New Westminster, B.C." 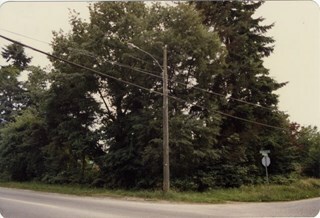 Photograph of trees and a telephone pole situated at the southwest corner of Douglas Road and Dominion Street. 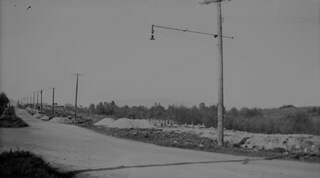 The large oak, hemlock, and fir to the left of the telephone pole were planted as part of the original landscaping of the Roberts' property in the 1920s. The photograph was taken from the Douglas Road and Dominion Street intersection. Note in blue ink on verso of photograph reads: "P.20"
Note in blue ink on verso of photograph reads: "Photo 1978"
Note in black ink on verso of photograph reads: "Looking at S.W. 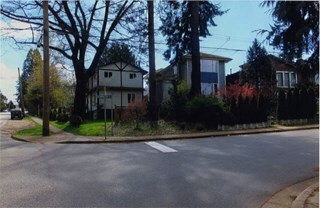 corner of Douglas Rd and Dominion Street, from intersection / Oak tree, hemlock tree, and fir tree, Japanese Plum Tree"
Photograph of the houses and trees situated on the southwest corner of Douglas Road and Dominion Street. The large oak, hemlock, and fir were planted as part of the original landscaping of the Roberts' property in the 1920s. The photograph was taken from the Douglas Road and Dominion Street intersection. 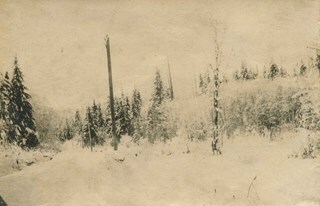 Note in blue ink on verso of photograph reads: "P.21"
Note in blue ink on verso of photograph reads: "Looking southwest from corner of Douglas Rd. 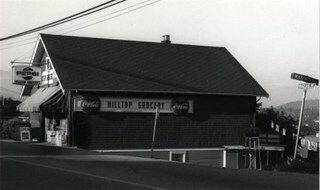 and Dominion St. / Oak Tree Hemlock Tree Fir Tree / planted in late 1920's"
Note in black ink on verso of photograph reads: "April 2015"
Photograph shows Hilltop Grocery located at 3690 Douglas Road, near the corner of Douglas Road and Woodsworth Street. It was built in 1916. Donor owned the Mayflower Meat Market. Donor owned the Mayflower Meat Market on Grandview-Douglas Highway. This book is not divided into chapters. 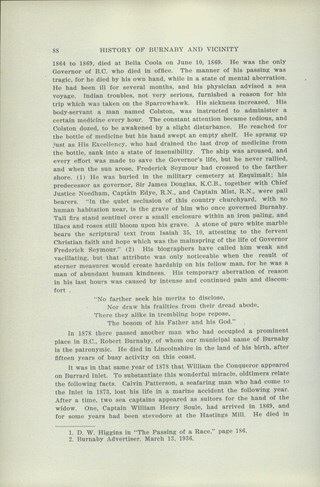 Sections have been created by Museum staff, based on the arrangement of topics in the book.